Welcome to our Spanish Property website. We currently have a 3 log cabin - unfinished project for sale in the beautiful Bayarque mountains, close to Tijola. The project todate has cost over 100,000€ but due to a recent berievement it is being sold for just 50,000€ ovno. We are waiting recent photos that will be up loaded here soon, so please call back or email me for immediate viewing. 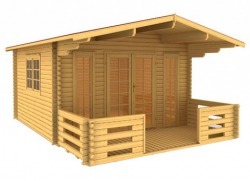 Each cabin is approx 55m2 and has 2 bedrooms, bathroom, kitchen, entrance area and living room. They each have a porch area. Land for sale with possibilities to build in the Almanzora, Albox, areas. We have various sites available, please contact me for up to date information. A traditional and professional family business dedicated to helping our clients changing their dreams into reality. From typical Spanish country villas and cottages (Cortijo or casa de campo) in spectacular mountain ranges to apartments and town-houses in beautiful Spanish villages. Over the last years we were able to help realise the dreams of many families in having a new Spanish property, in to reality. Our professional team works day after day to serve our clients in the best possible way. We build our own villas and restore old cortijo´s always respecting the environment and following the architectural guidelines our ancestors gave us. We can pass this valuable inherited information on to you, something a foreign builder will probably not know. Using our in-house architect and other specialists during every phase of the construction, we are able to implement your wishes and designs quickly. We are able to adapt every house into a comfortable home for you and your family. Hundreds of British families have already taken the decission that the beautiful Almanzora Valley is where they will live the Spanish dream, in their new Spanish Villa.... Why don't you come and find out why they chose this part of Spain over all other areas.... Almanzora.... Once you have visited, you won't want to leave! Of course it goes without saying that ALL of our Spanish properties are completely 100% legal. Don't believe the scare-mongering from the media.. Including the BBC... Of course they want to stop you leaving the UK... when you move here....another licence fee "bites the dust"! There has never been a better time to buy a Spanish Property. With all the bad press and media attention, we here in Spain are being scrutinised from all departments so it is virtually impossible to over look any laws or regulations... Whilst a little frustrating at times, it inevitably means that you can be safer in the knowledge that things are being done right. Today is a buyers market. Property prices here have been dropping over the last couple of years but they seem to have bottomed out.... So now is the time to buy before the predicted increase of the first quarter of next year. Don't say we didn't warn you! If you want to be assured of a one of our "no pressure" inspection tours, where we will not only show you the Spanish properties we have available or we can build for you, but also introduce you to "Real Spain", showing you our cultures and our way of life and introducing you to some of our many existing clients that can tell you first hand why they decided to move here and why they chose to buy from us, Inmobiliaria Almanzora. We have made it easy for you to contact us. Either by standard telephone, by PC or computer telephony (Skype or MSN), through email and now through the "Information request form" at the bottom of each page. Simply send us your phone number and indicate a convenient time to call and we will contact you! How easy is that!